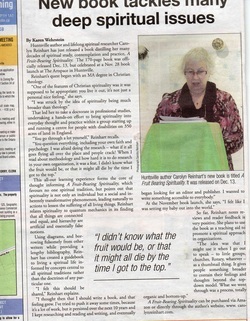 Here you will find news articles and press releases surrounding "A Fruit-Bearing Spirituality" both past and current. The most current news item is listed first in order from top to bottom. For reviews submitted by readers please click on the image. Look for the painted trees! TIME: 7:15- 9:00 p.m. Bring Along a Friend! Fruit-Bearing Spirituality is a fruit of years of formal study in the field of spirituality combined with 70 years of life experience. The book is not about religion, theology or church, but helps the reader to learn more about the meaning of the word spirituality for today and how to make it a growing part of his/her own life experience. It includes a consideration of our humanity and spirituality, our spiritual journey, our transformation and growth, our relationships, our integration of the personal and social and a guideline for changing the context/organization and relationship of spirituality and Quantum Physics. Reinhart’s book provides the most comprehensive guide that I have seen to a practical spirituality for humanity’s current situation … embodied, transformative of both individual and community, trans-doctrinal and open to all dimensions of the cosmos … she draws detailed guidelines for communities of enquiry striving for this transformation … analyses the different dimensions of the emerging spiritual paradigm, drawing on science, social theory and spiritual teaching. The hub of her conception is praxis: integrating being and doing … theory and practice … intertwined, informing each other. Many insights emerge: … oppressors and oppressed need to change … “the real journey takes place in the depths of our souls … psychological, social, cultural, political, economic, ecological, and cosmological” … an important book for understanding and engaging with contemporary spirituality. One of Dr. Reinhart's greatest accomplishments to date is publishing the book "A Fruit-Bearing Spirituality." Based on the four years of research conducted during her doctoral pursuits, the book focuses on an understanding of Spirituality Praxis, which involves combining theory and practice, interactively. It is her hope that readers of her book will understand more fully what it means to pursue the spiritual aspects of their own lives. Dr. Reinhart has been quoted as saying "We learned that transformational spirituality is concrete and has to do with personal, interpersonal, group, organizational, societal and global levels and thus affects our economic, political, social and spiritual lives and psychological culture." "A Fruit-Bearing Spirituality" is scheduled to be published 13th December 2013 by Circle Books. It will be available in paperback and eBook formats. The book's projected price is $19.99 (paperback) and $9.99 (eBook) and can be pre-ordered at Amazon.com and Amazon.co.uk.